Designed specifically for high-quality, low-cost output, the Ricoh Pro C5110S and Pro C5100S colour digital devices combine incredible speed with intuitive controls and advanced capabilities. Use them to produce exceptional images with vivid colours and clarity on a wider range of media without compromising convenience, space or resources. Produce high grade, professional jobs in-house and share them quickly and economically. These versatile, easy-to-use production printers can be used as a primary device in production settings or as an affordable, complementary system in your corporate reprographic department or print centre environment. 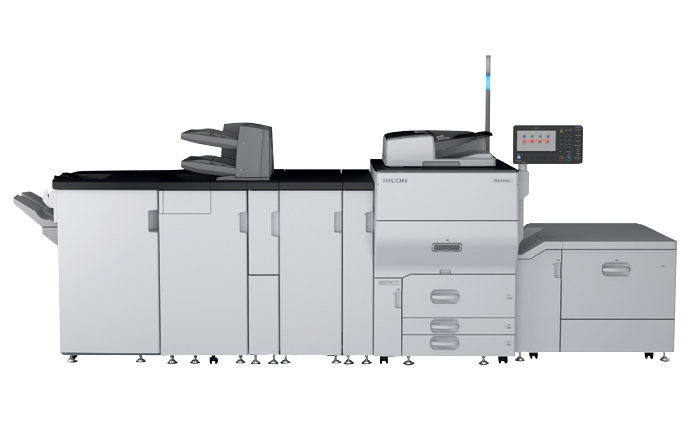 • Print full colour or black and white documents at up to 80 pages per minute (ppm). • Impress customers with colour image resolution up to 1,200 x 4,800 dpi. • Manage a wide range of media up to 330 x 487 mm. • Share documents quickly with innovative scanning capabilities. • Load up to 8,250 sheets for outstanding paper capacity. • Produce more projects in-house with advanced finishing options. • Print on a wide range of stock from textured media to envelopes. ​The Ricoh Pro C5110S has been designed to deliver leading quality output in a small, affordable footprint – without compromise. Among its many features are: a new chemical toner which offers vibrant colour, support for a broad array of papers and media including heavy textures and coatings, along with inline finishing options for high productivity. This light production model is a versatile choice for in-plant rooms, marketing departments and advertising agencies seeking high quality in-house capabilities, while print-for-pay and commercial printers will also benefit from its speed and productivity. Fastest in its class with speeds of 80ppm. Highly productive and automated through a large range of inline finishing options. Small footprint of approximately 1.5 metre. High quality output with new chemical toner, developed to fuse at a lower temperature for a quick warm up time and reduced environmental impact. Broad paper support offers enhanced printing on textured media, heavy coated stocks and envelopes. Print banners up to 1260mm in length through the advanced settings, adding to the wide range of application options. Easy to use with enhanced paper library and a customisable operation panel. Available with a wide range of compatible finishing options such as folding, booklet making and punching. Warm-Up Time: Less than 299 sec.